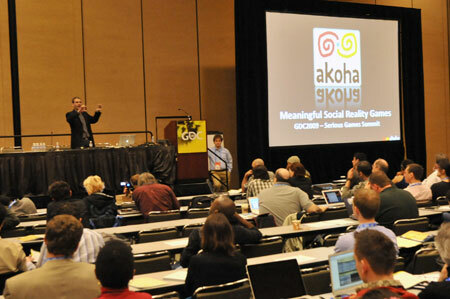 The response to current market challenges reported by several presenters at the GDC’s Serious Games Summit, due to its high degree of commonality, could eventually configure emerging trends for the segment. Many presenters strongly recommended planning for very early prototypes. Prototype goals would be three-fold: have functioning core game mechanics ASAP; mock-up the basic layout and key screens and elicit feedback. As Serious Games sponsors often don’t understand game technology, which is in stark contrast to entertainment games where publishers are usually game experts, half of early design assumptions might not wind up in the final product. This method, called rapid iterative development, is necessary for drawing out what customers really want, since they often can’t express it as a formal requirement. Therefore, the importance of early producing concept/de-risking demos, especially for customers who don’t know what Serious Games are about, was highly emphasized. Reducing the costs of creating games has increased in priority, especially for the military and business sectors (MOTS x COTS). The change management dimension of Serious Games implementation is gradually being acknowledged by Corporate Customers. As an example, Visual Purple has teamed with BTS, a Swedish company that trains business managers in implementing change and improving profitability. Clients include Coca-Cola, HP, IBM, Microsoft, Nokia, Sony and Vodafone, and span the globe. “An effective game has to appeal to upper management (which sponsors it but does not understand videogames) and be satisfying and challenging for the end users (who often belong to the younger generation that has been playing games for years), says Ed Heinbockel, founder and CEO of Visual Purple. To be able to hit both of these objectives, Heinbockel recommends a modular approach to game design and that decisions be controlled by the design team. “Our programmers build tools (for the designers), not specialized software programs,” he says. He also recommended an immersive experience for end users, to pull them out of normal distractions. “Modern managers are so busy they have CPA (continuous partial attention),” he noted. Traditional testing (bugs, playability, etc.) is only half the battle. Subject matter must be 100% correct, and using SMEs (Subject Matter Experts) for checking accuracy is highly recommended. Tangible metrics, for ROI correlation, are gaining increasing importance. The term “hybrid studios” refer to studios that either combine entertainment and Serious Games developments, or are Serious Games focused with a background in commercial games. With regard to “hybrid games”, the barriers between game types are blurring, so that (for instance) it is perfectly possible to build a Serious Game that is both mobile and casual (more thinking than action).